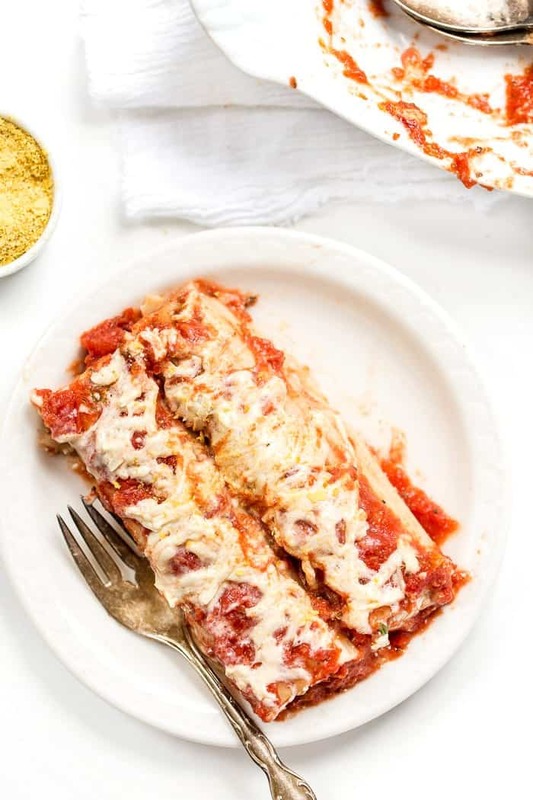 This vegan manicotti recipe is made with a creamy tofu ricotta filling and topped with a homemade tomato sauce. 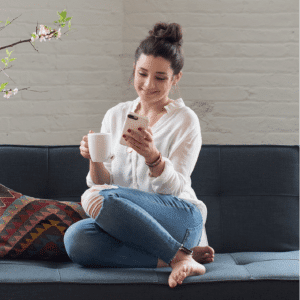 While it might sound complicated it's easy and ready in just 45 minutes! As we're approaching the holidays, it's hard for me to not reminisce about the amazing, gluten-filled meals I used to enjoy with my family this time of year. If you haven't read my story before, I grew up spending the holidays with my loud, boisterous and food-loving Italian side of my family. That meant lots of gluten and LOTS of dairy. When I removed both of those things from my diet, which was about 8 years ago now (gosh how time flies), I had to completely reimagine the way I approached the holidays. 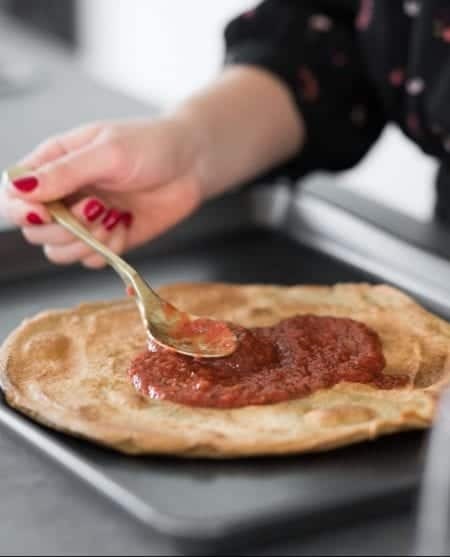 I had to bring my own foods, I had to make my own sauces, and while it was tough in the beginning, the more I started experimenting in the kitchen, the more I realized you actually can recreate those dishes to suit all sorts of allergies. 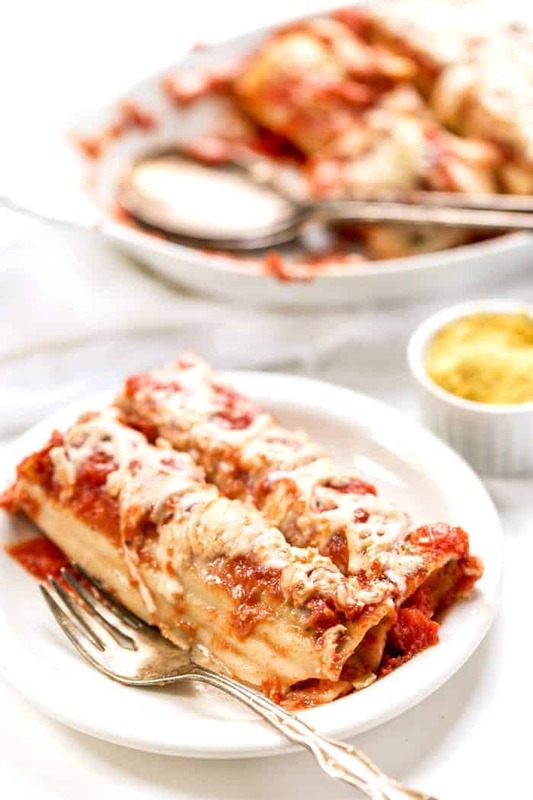 Manicotti is something that I have loved since I was little. 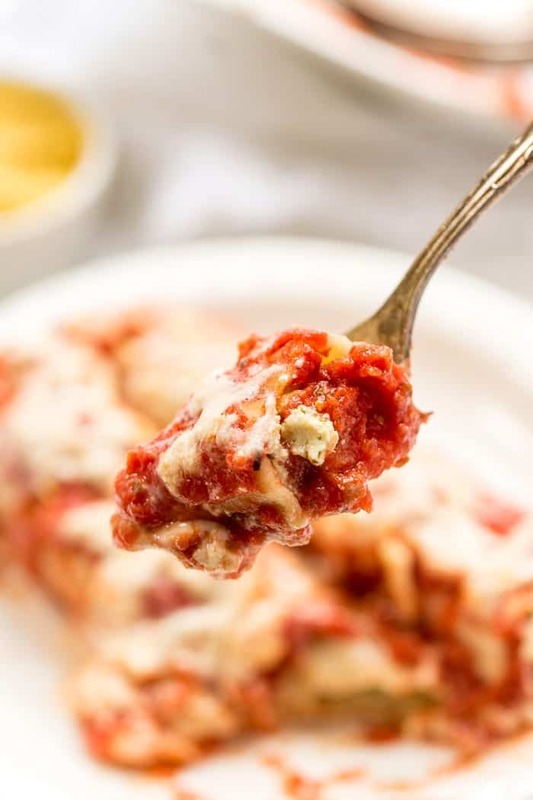 The creamy ricotta filling, the warm, bubbly tomato sauce and deliciously creamy cheese on top, all came together into one perfect dish. And since it's a dish that is so full of everything that I can't eat, I kind of just pushed it aside. But after my trip to Italy, I was reinspired by my heritage and decided I needed to figure out a way to make this gluten and dairy-filled dish into something that I (and you!) could enjoy. 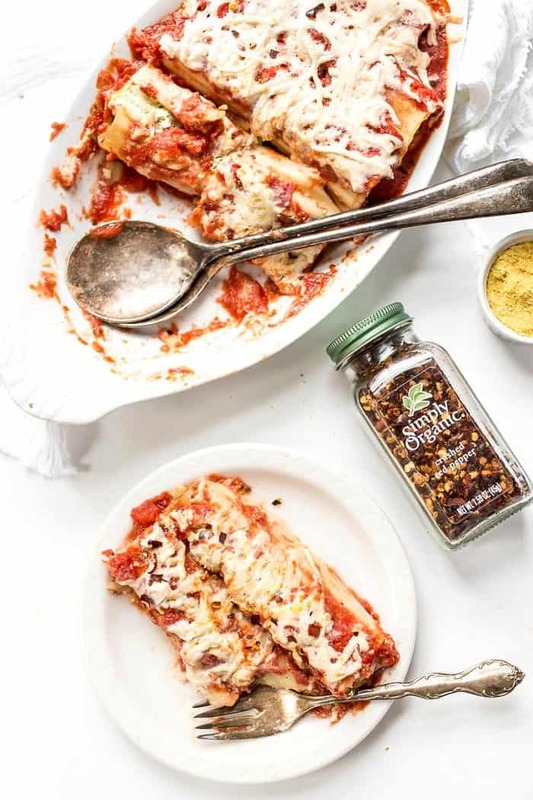 So that's what we have today…a vegan manicotti that is out of this world delicious! I decided to use tofu as the base for the filling as it's not only fluffy and moist in texture, but it's also pretty bland (i.e. takes on flavor really easily). I also decided to add in some fresh spinach just like my grandmother and mom used to do. 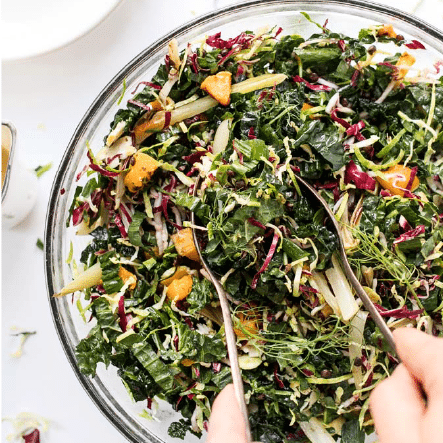 It's a great way to sneak in some greens, and you can't taste it at all! Plus, it makes them look really pretty when you cut into one. To flavor the tofu ricotta, I actually decided to go with dried spices (we're actually only using dried spices in this recipe)! I chose dried spices, because more often than not, you have these spices in your cabinet already. And if you don't, then you probably should! Check out this list of my essential spices for flavorful cooking if you need some help! When it comes to dried spices, the only company I turn to is Simply Organic. Not only do I adore the care they put into each of their products, but the flavor is always on point! You can tell as soon as you open up one of their spice bottles that it's fresh and is going to add so much depth to your dish. And we're using quite a few of their spices in this recipe. 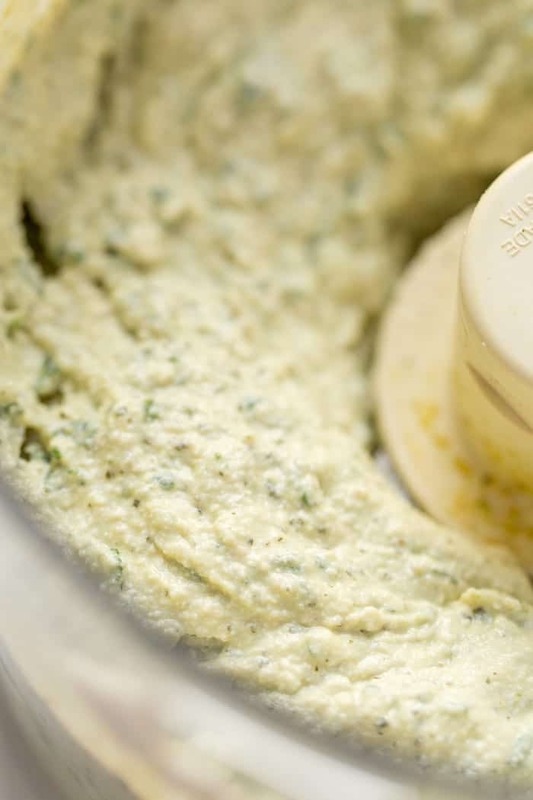 We started with their nutritional yeast for a nice pop of cheesy flavor, then also added in some of their garlic powder and parsley to the ricotta. 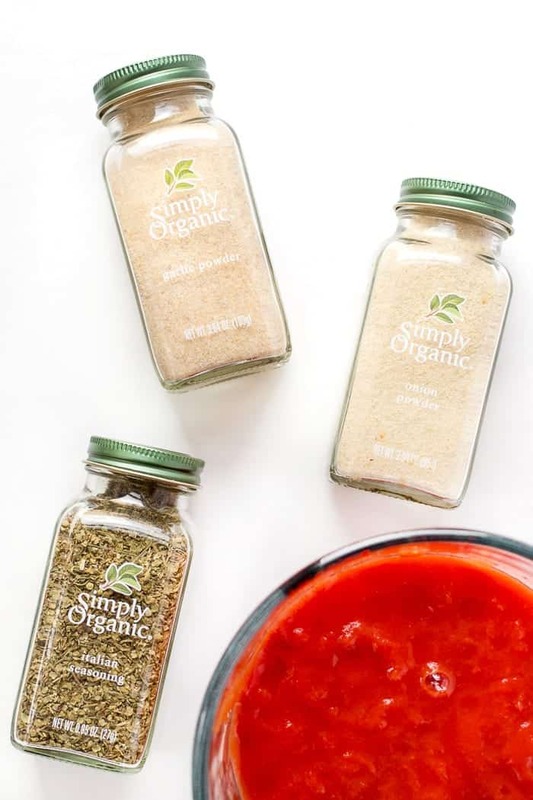 For the homemade tomato sauce, we're using their Italian seasoning blend, some garlic powder and some onion powder. Those three together are my absolute favorite way to increase the “Italian-ness” of a dish! Of course, I can't forget to garnish with their red pepper flakes! They add just the right amount of heat and really make the whole dish light up your taste buds! 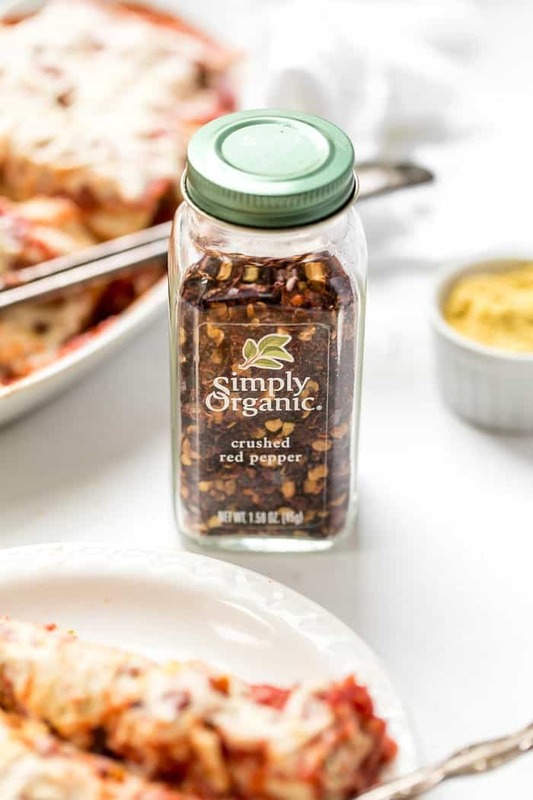 As part of today's post with Simply Organic, I also want to tell you just a little bit more about their campaign, Cook for a Change! I took part in this campaign last month sharing my Vegan Green Curry recipe, but if you didn't have a chance to check that out, let me share what it's all about. Cook for a Change is centered around helping you create unique, healthy dishes from scratch to show you how much joy cooking can bring to you and your loved ones. Personally, there's no better time than the holidays to make something that speaks to your heritage, that is familiar (but still healthy), and that brings your favorite people together around the table. And that's exactly what I did with this manicotti! I made it with my own healthy twists, but served it to my entire family and guess what? They absolutely LOVED it! They couldn't believe how much it tasted like the “real thing” and they even asked me for the recipe. Now that my friends is really saying something! So does that mean I'm going to be making this for Christmas dinner? I'm thinking yes! We typically have homemade meat and cheese ravioli on Christmas Day (fettuccine alfredo on Christmas Eve), so this would be the perfect plant-based alternative for those that want to partake in a dairy-free option! Trust me, this is one of the most comforting and delicious meals you will ever make. It's also really simple and comes together in under 40 minutes. 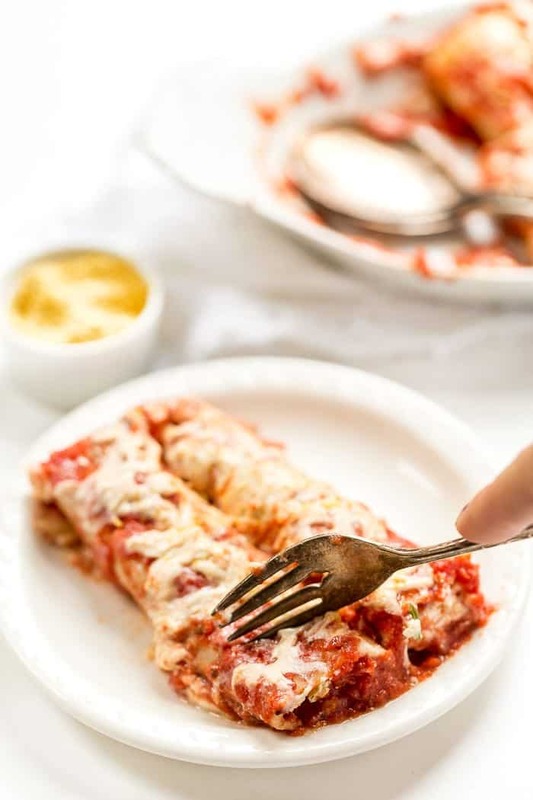 So whether you're looking for something plant-based to wow your holiday guests with, or you just need something snappy to get on the dinner table, this vegan manicotti is sure to be a hit! You can tag me on Instagram using @simplyquinoa or #simplyquinoa and that way I can see some of your holiday traditions! I'll be sure to share some more of mine with you as well – this is by far my favorite time of year! I want to also share a really fun part of this campaign…a giveaway! 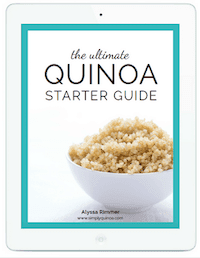 Our goal is to get you cooking and to inspire personal change – and social good. For each use of #CookForAChange, Simply Organic will donate one meal to the Ceres Community Project Healing Meals Program. Their goal is to provide 1,200 organic meals* to critically ill patients during the holiday season! With your help (just simply sharing your photos and using #CookForAChange), together we can help many. Learn more about the giveaway right here! 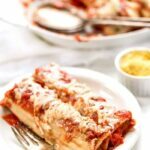 This vegan manicotti recipe is made with a creamy tofu ricotta filling and topped with a homemade tomato sauce! 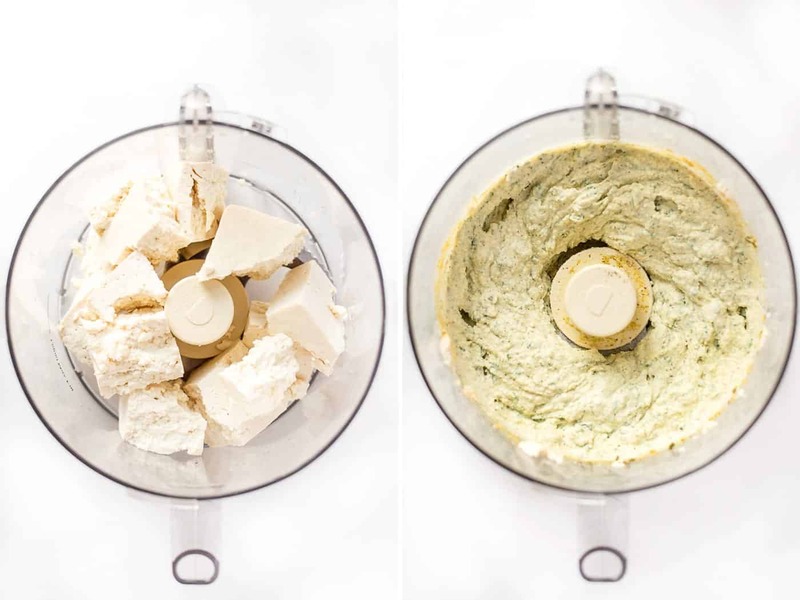 Crumble the tofu into a food processor and pulse together until crumbly. Add the remaining ricotta ingredients (minus the spinach) and pulse until mostly smooth. Pulse in spinach. Transfer the ricotta to a piping bag (or make your own with a plastic storage bag - watch the video above for instructions! ), and set aside. For the sauce, mix together the tomatoes, spices and salt. Set aside. Cook the manicotti according to package instructions. Rinse under cold water and set aside until they're cool enough to handle. Once ready to assemble the dish, add 1/2 the tomato sauce onto the bottom of a 9x13 baking dish. 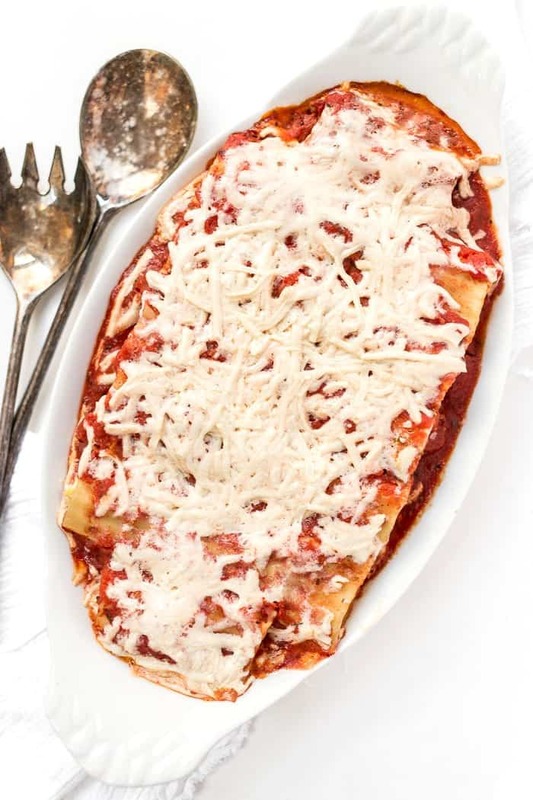 Using the piping bag, fill the manicotti shells with tofu ricotta. I found it easiest to do one half and then fill the other half. Place the filled pasta into the dish and continue until all the noodles are filled. Sprinkle the top with cheese. Cover the dish with aluminum foil and bake on the center rack for 30 - 35 minutes. With 5 minutes left on the baking time, remove the foil. Allow the manicotti to cool for at least 5 minutes, then transfer to plates and sprinkle with red pepper flakes. This post is sponsored by Simply Organic. 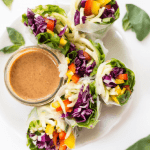 Join the Cook For A Change movement – explore new flavors, ideas and recipes that create change in the kitchen and in our hearts. Your ricotta is my go to recipe. I’ve made it tons of times and use it in multiple recipes. Quick question…can I make the ricotta ahead of time? Amazing!!! I’m sharing it in a lasagna recipe soon too 😉 And yep, you could totally make it ahead! Sounds delicious! I am really looking forward to trying this recipe. Thanks for sharing!